Thin toasted strips of crispy green nori, mild and sweet. A healthy snack and versatile, fun condiment. Delicious eaten right out of the bag. At tasty addition to miso soup. Garnish grains, noodles, and salads. Very low sodium, fat free, and a good source of vitamin C.
Eden Toasted Nori Krinkles are made from the species of nori, Porphyra yezoensis. Once grown wild along the rocky shores of Japan, but for the past 300 years, to meet the ever growing demand for this delicious and nutritious nori, it has been cultivated. Its crispy yet soft texture, mild flavor and mouth watering aroma have made it one of the most popular varieties of nori in Japan today. It is considered to be premium quality and is often found in gourmet food shops. 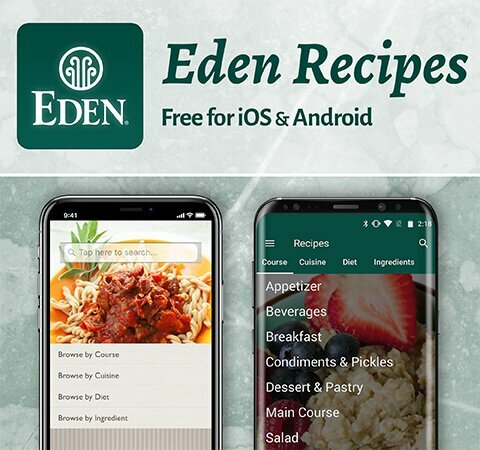 Eden's nori is cultivated off the west shore of Ise (ee-say) Bay in Japan, an area surrounded by National forests and mountains, known as the 'Ocean by Mountains'. Pristine mountain rivers nourish the bay creating a mineral rich environment. This area leads all of Japan in ecology movements. Development is forbidden to ensure future generations the legacy of this famous edible seaweed resource. Nori cultivation is an intricate craft in that spore quality, water temperature, a pristine growing environment and proper drying methods are crucial to producing the best quality product. 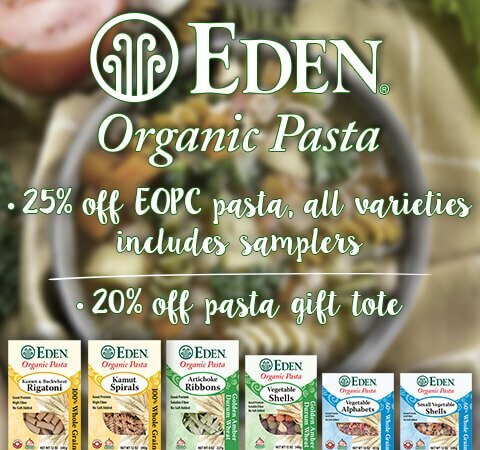 Eden's nori is cultivated in the traditional manner, using a system of woven rope nets that are tied to bamboo poles and horizontally suspended in the bay. This intricate substratum is placed in the shallow bay in late September or early October. Over the autumn, winter and early spring months, with the coming in and out of the tide, and the cooling of the water temperature, the nori spores attach to the netting and slowly develop into nori fronds or leaves. In spring the fully developed fronds are harvested at low tide by scraping the nori from the netting and taking it ashore. The nori is washed with pure water, and spread on wood frame drying screens where it is dried by hot air into thick, cake-like layers. After drying for several hours the cakes of nori are broken into smaller pieces or flakes. The nori flakes are now ready for a final drying, using the unique processing equipment called a 'steam toaster'. The steam toaster is a relatively new system, that uses hot steam to evaporate the moisture in the nori. Regular oven toasting is not able to toast as evenly as this new process. The end result is perfect, evenly toasted flakes of nori, that are so light and crispy they almost melt in your mouth. Eden Nori Krinkles are fat and cholesterol free, and a good source of vitamin C. According to the FDA, "Low fat diets rich in fruits and vegetables (foods that are low in fat and may contain dietary fiber, Vitamin A, or Vitamin C) may reduce the risk of some types of cancer, a disease associated with many factors." Also, "Diets low in sodium may reduce the risk of hypertension or high blood pressure, a disease associated with many factors." Eden Nori Krinkles are very low in sodium (5 mg per serving). 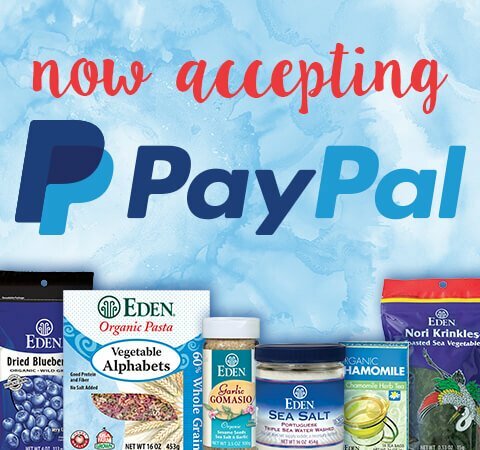 For those who use sea salt that contains low amounts of iodine, nori is an excellent source of iodine providing 70 percent of the daily value (DV). 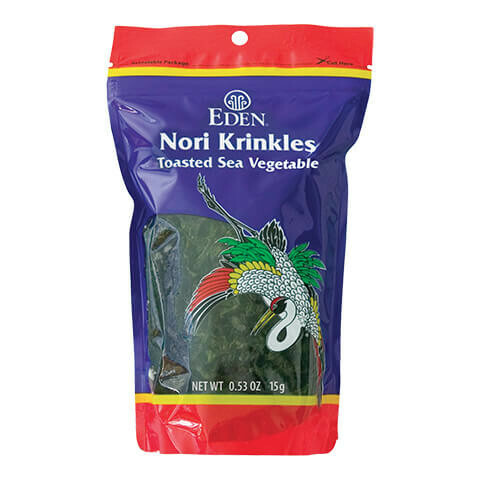 Eden Toasted Nori Krinkles can be eaten right out of the package for a great tasting, healthy snack. Traditionally used to make quick miso soup in place of wakame, and adding directly to the bowl of soup when done without cooking. It can also be used to make sushi, as a condiment on top of cooked grains and traditional noodles with broth, and it also great on salads, vegetables and in stir fries. One popular Japanese dish called 'Ochazuke', is delicious with Nori Krinkles. Place a little cooked rice in a bowl with a small piece of Eden Umeboshi Plum or dash of Eden Wasabi (Japanese Horseradish) Powder, and add the Eden Nori Krinkles and pour hot, steeped, Eden Organic Sencha Tea over the ingredients. Garnish with chopped scallions and eat.